I enjoyed this reflective piece from Math with Bad Drawings about determining whether or is larger. The final answer, involving the number , was a complete surprise to me. Short story: is the unique number so that for all positive . This student submission again comes from my former student Alexandria Johnson. Her topic, from Algebra II/Precalculus: computing the composition of two functions. The following link is to a worksheet over composition of functions. The worksheet allows students to explore composition of functions without outright telling them what composition of functions is. Instead, the students are working on real world problems about shopping in a store that is having a 20% sale with mystery coupons. In the worksheet, students explore whether or not it matters which discount is applied first and the equations that go along with each scenario. This worksheet is interesting because it approaches composition of functions in an explorative way and it is using a real-world situation students in high school may find relatable, which can help hook students that are math-phobic. Computing the composition of two functions requires prior knowledge of basic operations and combining like terms. This topic will expand upon their knowledge of basic operations by applying them to functions. Students will be able to add, subtract, multiply, and divide functions. Students should be able to use the distribution property; this is important when students are writing (fog)(x) and (gof)(x). During this topic, students should be able to expand upon their knowledge of creating functions from real world problems, which can be seen in the worksheet from the link above. Musical composition is a way this topic can appear in high culture. Musical composition is the process of combining notes, chords, and melodies in a particular way. Arranging the notes, chords, or melodies in different ways can change the composition. Function composition is the combining of different functions f(x) and g(x) in different ways like addition, subtraction, multiplication, and division. Order usually matters in function composition just like in musical composition. If you have several band students, or musically inclined students, this would be a good hook to grab students interest. This student submission comes from my former student Austin DeLoach. His topic, from Precalculus: using a recursively defined sequence. One activity that would be interesting to introduce recursion would be Fibonacci’s rabbit problem. In his book, Liber Abaci, Fibonacci introduced a problem where you start with one young pair of rabbits and try to find out how many rabbits you would have after a year. Every month, a grown pair of rabbits can give birth to a new pair, and it only takes one month for a young pair to grow up and be able to reproduce on their own, and the rabbits also never die. This is one of the most popular recursive sequences (the Fibonacci sequence), and, by itself, can be solved without a prior knowledge of recursion, but is a very good way to introduce the idea once the students begin to analyze the pattern of how many pairs of rabbits there are after each month. This problem is laid out in this video, https://youtu.be/sjQlW6cH3Ko but it is not necessary to show the video to introduce the problem. One major place that a solid grasp of recursion can be used is in computer programming courses. Although not everyone takes these, they are becoming increasingly popular and the field is not likely to shrink any time soon. In programming, there are certain things that can either only be written recursively (as opposed to explicitly) or at least ones that are simpler to write and understand with recursion than with an explicit algorithm. There are also times, depending on the language and content, that a recursive function can be more efficient. Because of this, an understanding of recursion is becoming increasingly important for more people, and the ability to write and understand how it works is practically becoming necessary. So, even though not every student will go on to take computer science, many will, and the basic idea is still important to understand. There is a series of Khan Academy videos on recursively defined sequences online. The first one is https://youtu.be/lBtb30SjU2Q and it shows how to read and understand what the basic frame for recursion is. Although Khan Academy videos are not always the most engaging for all students, they do work for many because of their consistent structure. This video in particular is about recursive formulas for arithmetic sequences. Without mentioning the vocabulary yet, the video does introduce the idea of a base case and the method for finding subsequent values. The video both shows how to look at a list of values and determine the recursive definition, as well as how to understand the recursive definition if that is what you are given. For a three minute video, it does a very good job of introducing important topics for recursive series and explaining the basic ideas so that students have a framework to build on later when more complex recursively defined sequences are introduced. 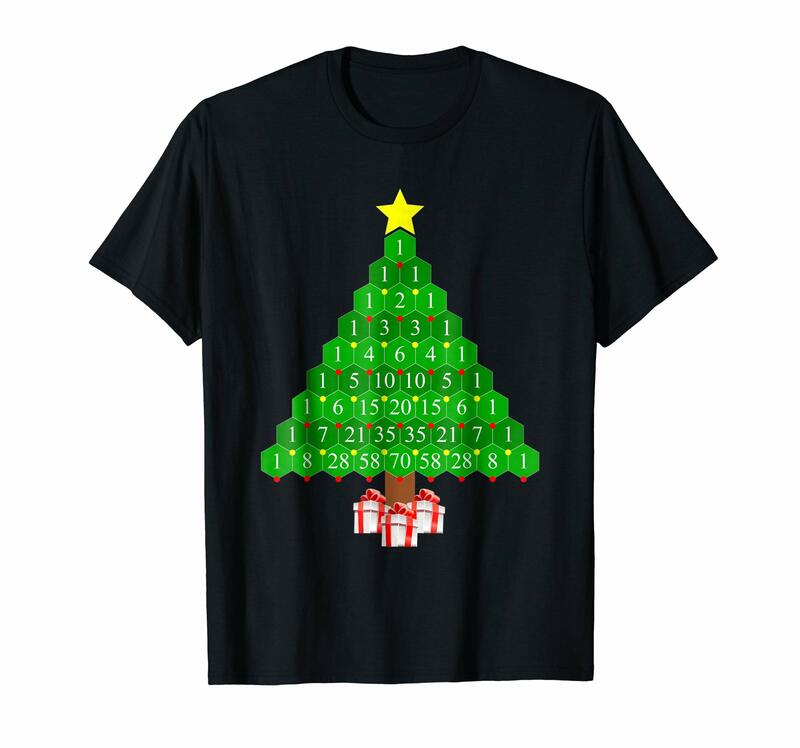 This was another T-shirt that I found in my search for the perfect ugly mathematical Christmas sweater: https://www.amazon.com/Pascals-Triangle-Math-Christmas-shirt/dp/B07KJS5SM2/ I love the artistry of this shirt; the “ornaments” at the corners of the hexagons and the presents under the tree are nice touches. Today is 11/23, and 1, 1, 2, 3 are the first four terms of the Fibonacci sequence. Courtesy Kris McCoy’s Pointless Math Fact of the Day.